Plants Vs Zombies toys are already invading US retail space and are now poised to take over UK toy shops. With fans numbered in the hundreds of millions, the Plants Vs Zombies game can be played across a range of devices including PC, smartphone, DS and even on Facebook. Stop the Zombie invaders by planting the correct Plants in their path. There are legions of Zombies that have already been turned into 3.75″ vinyl figures by fast growing US toy company Jazwares; many more waves of Plants Vs Zombie figures lie in wait. Plants Vs Zombies is a creation of US game designers PopCap, a subsidiary of Electronic Arts, who have been busy creating fun, free and funky games for over ten years. In the UK Character Options are the distributors of these fab new Zombie toys. Q1 2014 sees the launch of blind bag Mystery Fun Dead figures as well as the Plants Vs Zombies exploding Zombie figure with detachable arms and head. Character are also releasing a line of plush Zombie figures. 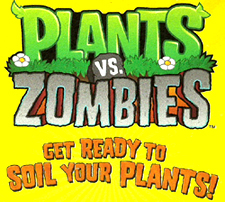 Florida-based Jazwares design licensed toys and are the current licensee for Plants Vs Zombies toys. Jazwares are set to open a UK office. A range of Plants Vs Zombies construction toys from K’NEX are available from 2014. These building sets bring to life favourites from the virtual world such as Zombie, Mummy Zombie, Peashooter, Sunflower and Wall-nut. Get ready for many more Plants Vs Zombies toys. This entry was posted in Plants Vs Zombies and tagged Plants Vs Zombies Toys. Bookmark the permalink.